Decorative indoor, residential LED low profile square. 4000K, 120 volts. White acrylic diffuser. Hidden cam-latches provide easy diffuser removal for installation and maintenance. 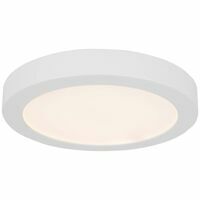 Works with most standard incandescent dimmers. All mounting hardware included. cULus Certified to US and Canadian standards and listed suitable for damp locations. ENERGY STAR certified.